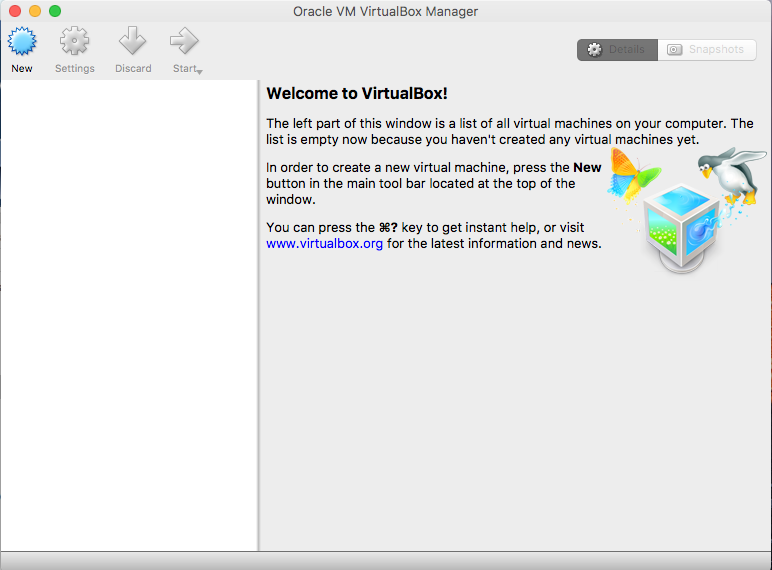 VirtualBox is a free, open-source virtualization software for x86 computers currently being developed by Oracle Corporation. Virtual system may take up a lot of disk space and memory when it is running. If you are unsatisfied with its performance, or you decide to remove VirtualBox for other reasons, this guide could be helpful. 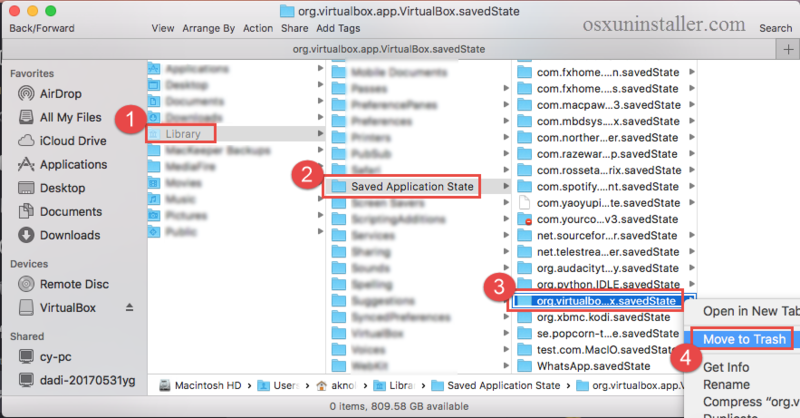 Multiple approaches are offered below to guide you through the proper removal of VirtualBox. 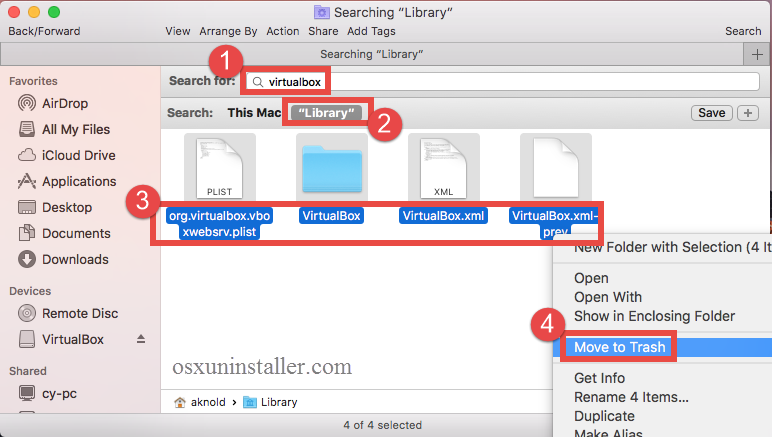 You can carry out any of them to fully get rid of VirtualBox on Mac. (3) Launch Activity Monitor, select the process with the name of the app in the list, then click the “X” button on the upper left corner, and click Quite button in the pop-up dialog. 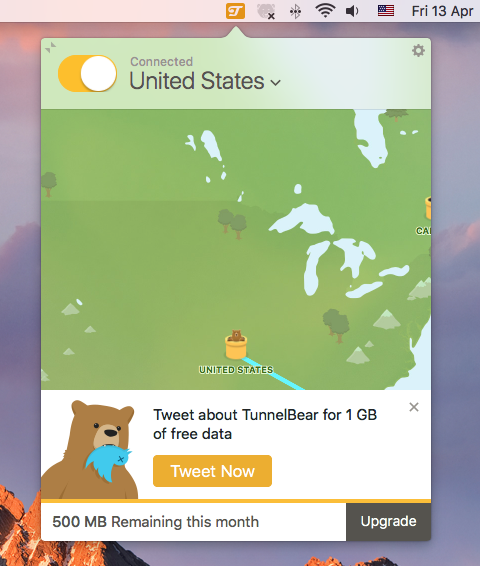 If the app fails to quit, then try Force Quite in Activity Monitor. After that you can carry out the standard uninstall, and two options are available here. When you install VirtualBox through the disk image file, you may notice that there exists a file named VirtualBox_Uninstall.tool in the folder. 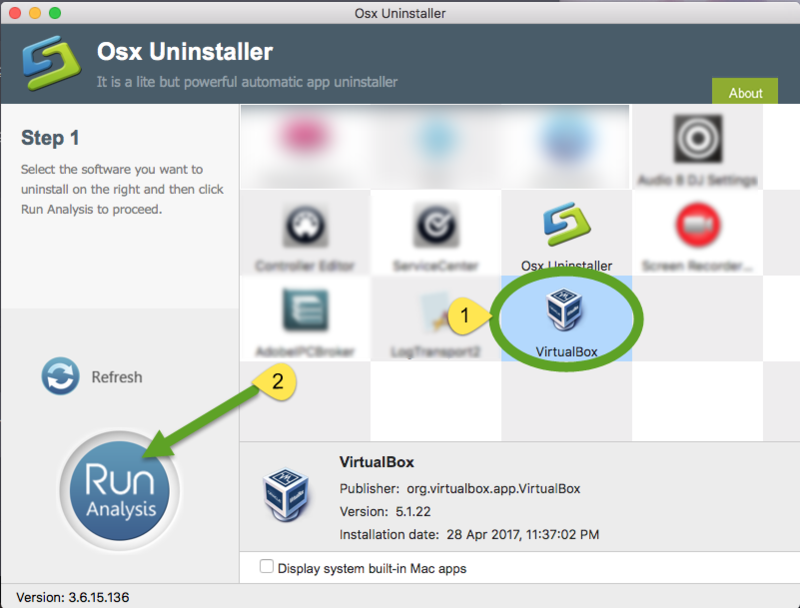 So if you keep the installation file on your Mac, you are suggested to run this tool to remove VirtualBox. Locate the disk image (dmg) file in the Finder, and double click to open it up. Double click on the VirtualBox_Uninstall.tool contained in the opened window. When prompted, click on Open button to run the script app in Terminal. 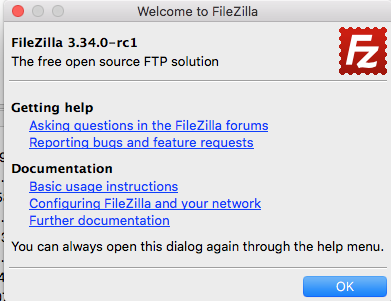 Type Yes in the Terminal window that appear, and hit Enter key to run it. Enter the administrator password and hit Enter key to confirm the removal. 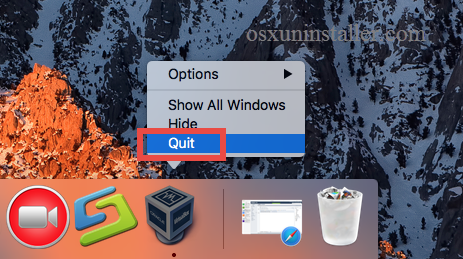 As the process is complete, close the window and quit Terminal from the Dock. 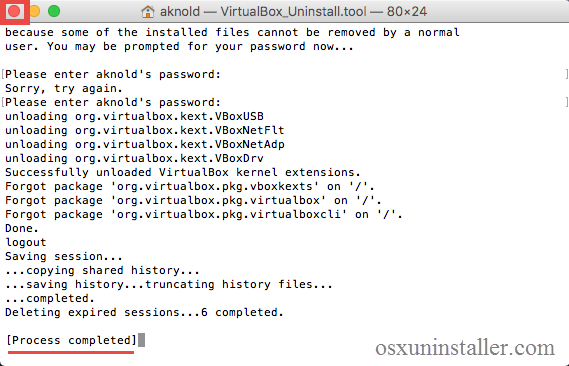 Most files pertaining to the VirtualBox will be removed by this way. If you don’t have the installation file on your Mac, download one, or take the steps below to delete it. 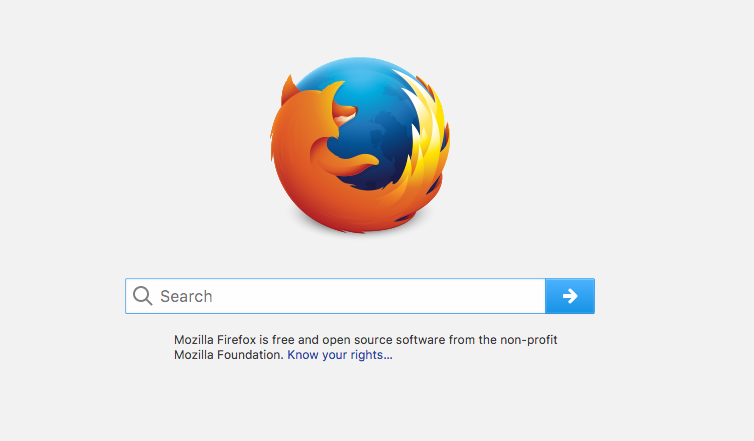 Open the Finder, and click on Applications in the sidebar to navigate to the folder. 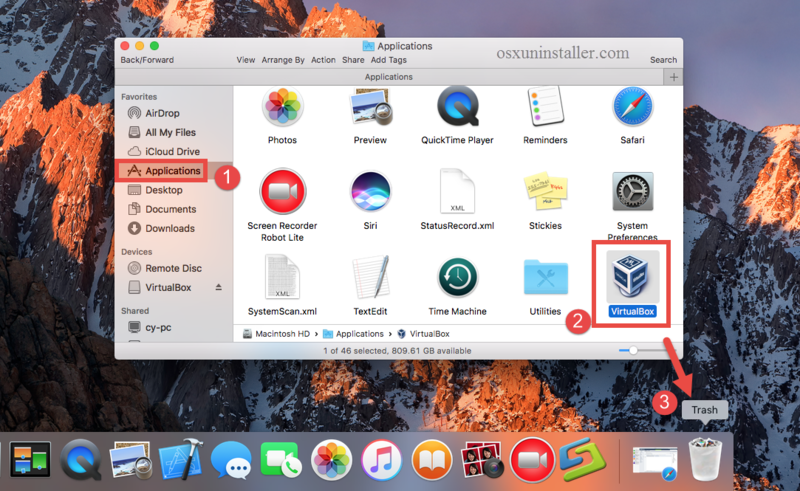 Locate and select VirtualBox, then drag the icon to the Trash and drop it there. 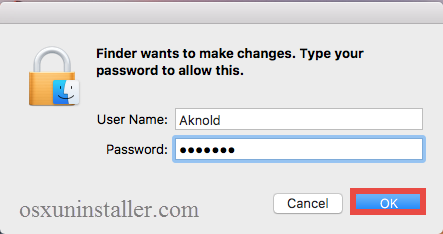 When prompted, type your administrator account password to allow this change. Right click on Trash icon and choose Empty Trash to perform the uninstall. Notice: Be cautious when you perform the last step. Emptying the Trash will instantly remove all the files you’ve thrown into the Trash, and this operation is irrevocable. Make sure you have not deleted anything wrong, and before emptying the Trash, you can restore the item by right clicking on it there and choosing the Put Back option. 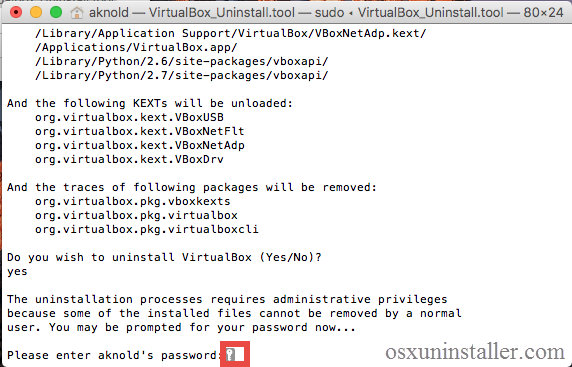 If you carry out the aforementioned ways to uninstall VirtualBox, there are still some additional steps you are supposed to take. The app itself has gone from the Applications folder, yet there must be some associated files lingering around the system, and you need to manually delete them to ensure a complete, clean uninstall. Type the path /Library in Go to the Folder box, and hit Enter key to open it. If you are a Mac novice, we do not suggest you to perform the deletion by your own, because any mis-operation might trigger problems on other apps or even affect system files. An automated uninstaller may be a better choice for inexperienced users. Or instead, you can utilize the Search feature in Finder to help locate related components. Type the path of the current user’s Library Folder: ~/Library, and hit Enter key. Finally, empty the Trash to delete VirtualBox leftovers permanently. Don’t you think that manual deletion of app leftovers is a little low-efficient and risk-taking? Some related files or folders do not even have the name of VirtualBox so you could fail to find them out. 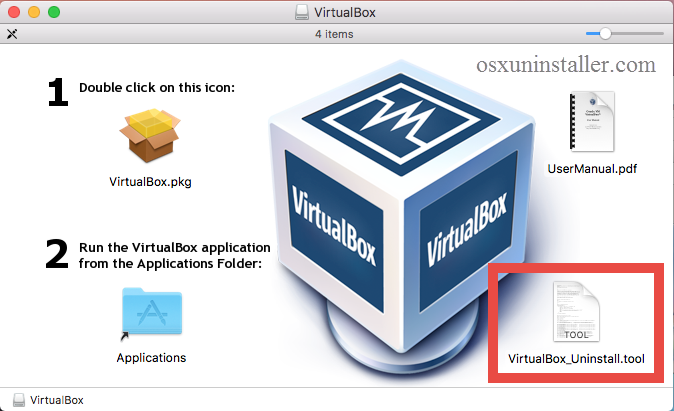 How to make sure if you have detected all VirtualBox files on the system? Well, if you are desired to save time or trouble in the task of uninstalling VirtualBox, the next section will demonstrate a perfect solution. 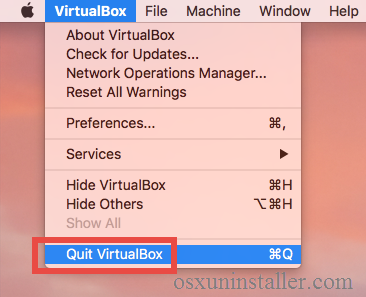 Is There A Shortcut to Remove VirtualBox? Sure! 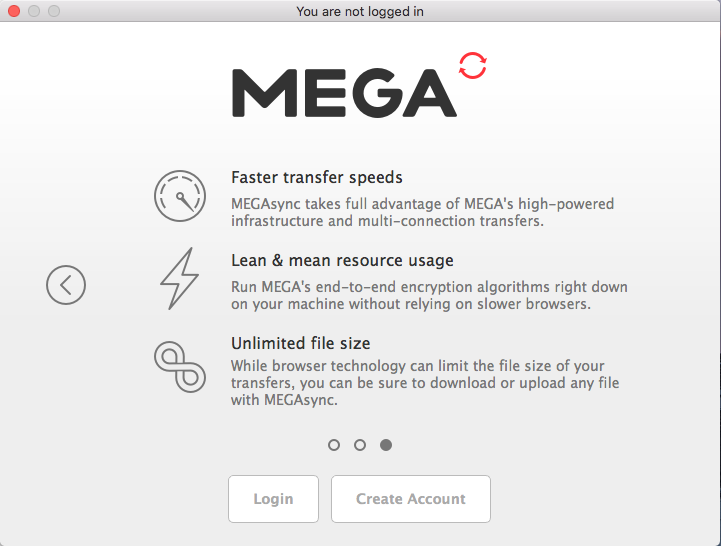 Some users complain that they cannot get rid of VirtualBox by regular methods. That may happens as different users have different issues, depending on the system and how they perform the removal. Luckily we have found a powerful, reputable uninstall tool that works for (at least) most apps running on the modern versions of system. 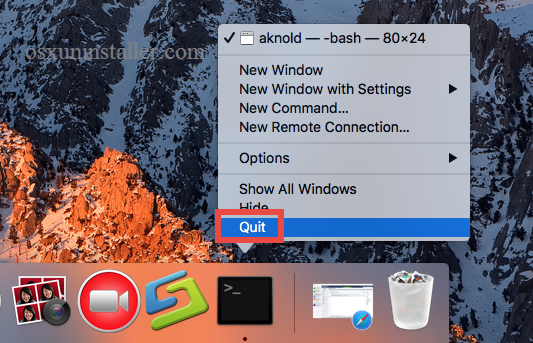 Featured with an intuitive interface and powerful engine, Osx Uninstaller functions as a reliable and handy tool designed for all-level users to uninstall any unwanted, problematic, stubborn and malicious apps without hassle. We have tested his tool and the result shows it can remove all VirtualBox components within a few clicks. 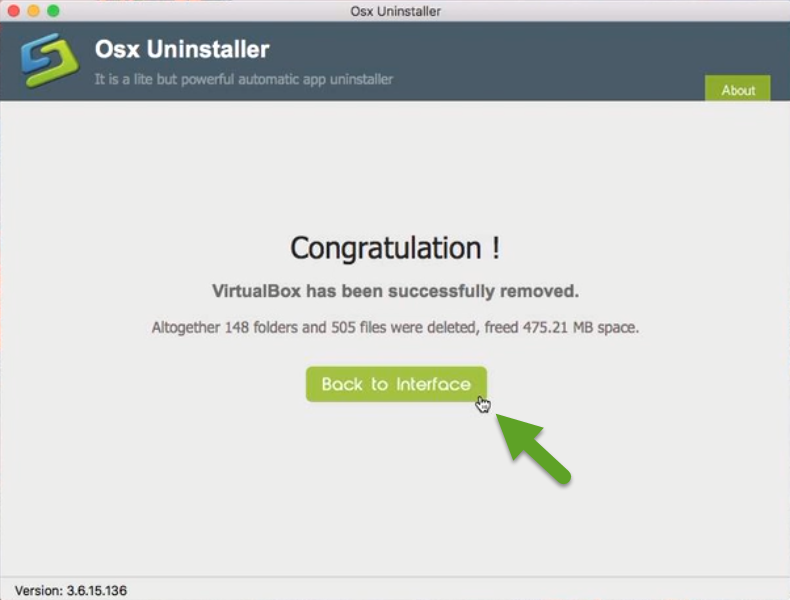 Now let’s take a quick look at how it works to fully delete VirtualBox on Mac. 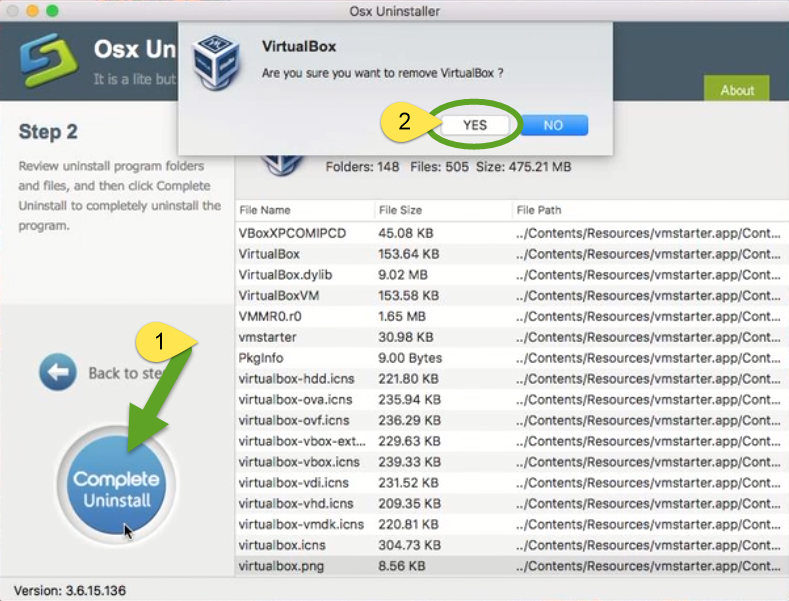 Here are the simple steps for using Osx Uninstaller to remove VirtualBox. Step 1. 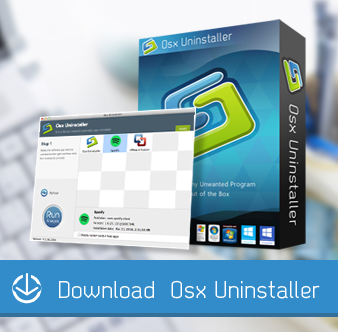 Download Osx Uninstaller and install itto the Application folder. Step 2. Launch Osx Uninstaller, select Microsoft OneNote and click Run Analysis. Step 3. Review related files and folders, click Complete Uninstall button, and click Yes in the pop-up dialog to fully remove all components of VirtualBox. Step 4. Click on Back to Interface button to re-scan currently installed apps. As you can see, VirtualBox have gone from the interface, which means you have entirely got rid of this app. The thorough removal completes in the few blinks of time. 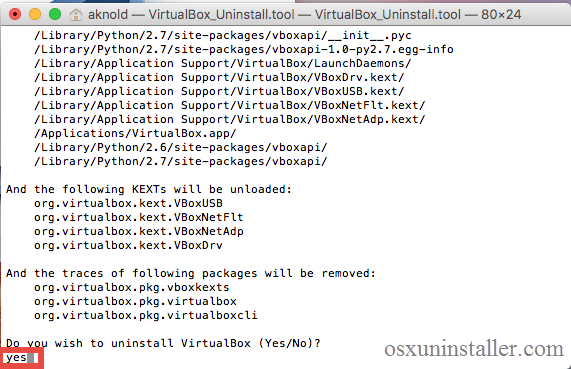 In this guide we list several solutions to uninstall VirtualBox. Is any of them helps solve your uninstall issue? Which one do you prefer to use to delete unwanted app? Anytime you have questions in uninstalling apps, don’t hesitate to contact us for help.